Wednesday 30th May 2018 marks the 10th anniversary of the passing of Biaggio Signorelli to Asbestos Cancer. 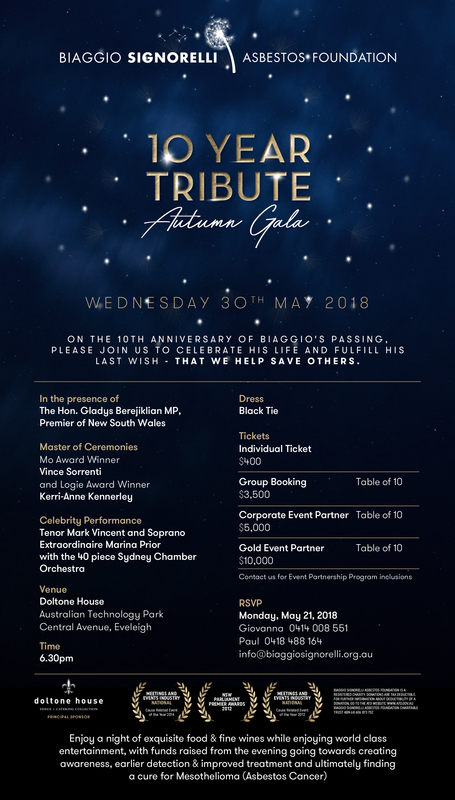 We will be holding an Autumn Gala Ball to celebrate the life of Biaggio and fulfil his last wish – that we help save others. Enjoy a night of exquisite food & fine wines while enjoying world-class entertainment, with funds raised from the evening going towards creating awareness, earlier detection & improved treatment and ultimately finding a cure for Mesothelioma (Asbestos Cancer). We will be joined by special guest, The Hon Gladys Berejiklian MP, Premier of New South Wales.